Venture Capital is the term which is more associated with those ideas which have the potential to become a suitable and successful business opportunity in an entrepreneurial environment. This might be the seeding money provided by investors or venture capitalists to start-up firms and small business that can be turned into profitable and long term growth ventures. This is definitely an important source of financing for new comers and start-ups that normally either don’t have access to capital markets or being avoided by the banks or others well established financial institutions. The success of such start-ups or ventures typically associated with high risk for the investors but definitely it has the higher return. This type of capital is also known as private equity. The importance of Venture Capital cannot be ignored from creativity and innovation’s point of view where project and product developmentstages proceeds from idea generation to commercialization stages. So, Brainmeasures program of Capital Venture certification is the best choice to cater the needs of rapidly changing environment and demanding opportunities in the field of venture capitalism, investment management and business stat-ups. This online certification will equip you with the best practices and tactics for Venture Capital management and enable you about how to become more efficient and effective managers, financial analyst, opportunity analyser and expert in assessing the idea conception, requirement analysis, designing, production or manufacturing, testing, quality champions and successful commercialization of ideas where Capital Venture is required from beginning. Apart from learning of different Venture Capital acquisition and formation techniques, you will also be assessed with online exam and assignments that will be provided to you by the end of different topics in the certification program. This will definitely an assessment of your skills, knowledge and experience that will not enable you to find the missing paths and commons areas in these three but also equip you with the additional expertise that you might be required to become a successful businessman, entrepreneur, manager, business analyst, venture capitalist or potential business opportunities expert. As this certification holds its multidimensional and multidisciplinary application, therefore expected salary will be varied according to each industry and field of the certificate holder. However, an average expected salary for investment manager, entrepreneurial decision maker and market analyser certification holder is expected around $85,000-$150,000 per year which varies according to the nature of business, related field and reputation, windows of opportunity for new ventures, level of competition as well as experience of the individuals who are providing their services or employed in different companies that belong to different industries. 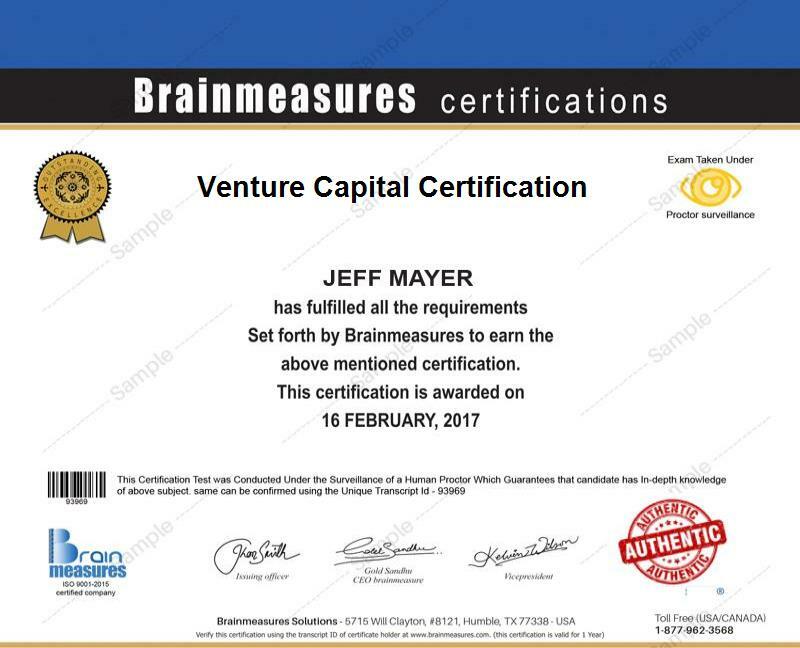 Venture Capital certification from Brainmeasures is a distinctive certification in the fields of creativity, innovation in business, idea generation, venture start-ups, product and services development and entrepreneurship that is supposed to provide information, expertise and knowledge about the demanding field. Scope of this certification is very wide and prevails to lot of industries. Beneficiaries of the certification can be from IT industry, manufacturing or service world as well. Venture Capital certification course from Brainmeasures is exclusively designed for idea generator, venture capitalists, business developers, project developers, project/product/service managers, entrepreneurs, professionals and for all those individuals who wish to enhance their skills for arrangement of Venture Capital and investment for start-ups and business development.